The first complete collection of music videos from the Definitive Jux camp! 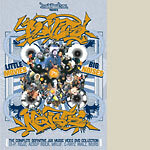 Includes videos from: El-P, RJD2, Mr.Lif, Murs, Aesop Rock, Hangar 18, and C-Rayz Walz! Also includes a bonus CD that contains the UMIXIT program! Interactivity at the fullest! DVD also has bonus footage!